You want to mark selected transformations as restart points in a job. If the job fails to complete successfully, you want to be able to rerun the job from the point where it failed. Open a SAS Data Integration Studio job. Right-click a transformation and click Assign as Restart-Point in the pop-up menu. The Restart-point Setup window is displayed. Specify a saved-state library in the Restart-point state library field. You can click Select a library to select an existing library or click New to register a new library. After you have specified a library, you can click Properties to access its properties window. Note that the saved-state library must be local to the server executing the job. You can also specify an optional library to save the temporary tables in the job in Alternative library for temporary tables (optional) field. You need this library only when your job requires the SAS work tables that were created in previous steps when you restart it. You can either select an existing library or register a new library. For details about redirecting output, see Redirecting Temporary Output Tables. Note: As implemented, the save-state feature does not save the SAS WORK library during a checkpoint. You must determine whether any particular checkpoint-flagged step (or subsequent step) requires the SAS WORK tables created in preceding steps. If so, you must change the physical location of those temporary tables as part of the job design. If the temporary tables are left in SAS WORK, a rerun with a restart pending can result with “Table-not-found” errors. You can change the location on the Physical Storage tab of the properties window for the temporary table. You can also use the Alternative library for temporary tables (optional) field to specify the default temp library for the job to be something other than SAS WORK. Click OK to close the Restart-point Setup window. Note: You can specify one or both of the libraries for the checkpoints in all new jobs. Use the Restart-point state library and Alternate library for temporary tables on the Code Generation tab of the Options window. You an access the Options window at Tools Options in the menu bar. Right-click any additional transformations that require checkpoints and click Assign as Restart-Point in the pop-up menu. 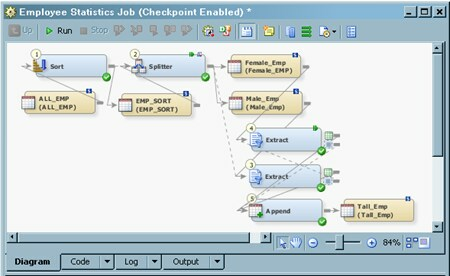 The following display shows the Diagram tab for a sample job with checkpoints. Note the checkpoint icon overlays ( ) in the upper-right corners of the Splitter transformation and the first Extract transformation.